Canara Bank PO Probationary Officers Admit Card 2018 (Call Letter) download /Canara Bank PO Admit Card 2018 released at canarabank.com, Exam on December 23: Canara Bank PO Probationary Officer Admit Card 2018: Canara Bank has released the admit card for Probationary Officer posts for admission to Post Graduate Diploma in Banking and Finance (PGDBF) course. Candidates can download their respective admit card from the official site of Canara Bank at canarabank.com. The admit card will be available from December 03 to December 23, 2018. 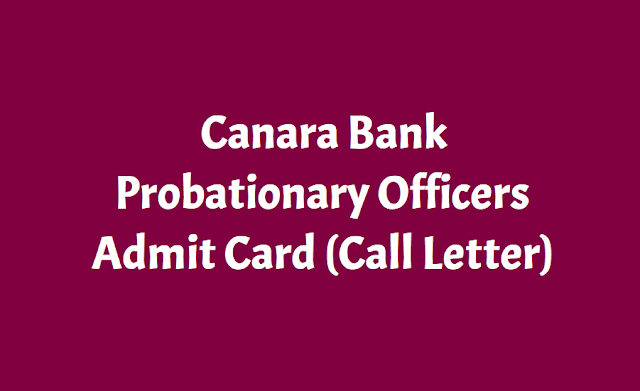 The admit card for the online test to recruit probationary officers (PO) in Canara Bank can be downloaded before December 23.The admit card was released on the official website of the bank on December 5. The online examination will be held on December 23. Here is the direct link to download Canara bank PO exam admit card 2018. The admit card will be available for download until December 23. The application process for filling 800 probationary officer (PO) vacancies through admissions to the specially designed One year training course leading to Post Graduate Diploma in Banking and Finance (PGDBF) either through Manipal Global Education Services Pvt Ltd., Bengaluru or NITTE Education International Pvt Ltd., Greater Noida, which are recognised by UGC began on October 23. The number of vacancies is provisional and may vary according to the actual requirement of the bank. Candidates will be selected through a process consisting of online objective test followed by Group Discussion and interview. Successful candidates will go through a nine month course (classroom studies) conducted either at Manipal Global Education Services Pvt Ltd, Bengaluru campus or NITTE Education International Pvt Ltd. Greater Noida campus followed by a three months internship at any of the Canara Bank branches/offices. Candidates who want to download the admit card have to fill in the login credentials like Registration No / Roll No and Password / Date of Birth and enter the captcha code. The selection process includes an online objective test followed by group discussion and interview for Canara Bank PO Recruitment. Candidates can check the official site of Canara Bank to check more details of job post and admit card. Step 6: In this PO recruitment page, click on "Download Of Call Letter"